I really wanted to cook some seared ahi the other night and I was looking for the perfect side dish. Well low and behold! There was bok choy in my produce box that week so I knew exactly what to do. A light and refreshing Asian inspired slaw. It was perfect for the warm summer night and was exactly what my gorgeous piece of ahi needed. Something not too heavy but loaded with flavors that would complement the simplicity of the fish. The dressing for this slaw is tangy, sweet, has a nice sesame flavor, and just a little bite from the fresh garlic. This is great for any Asian inspired dinner you have planned. I also had it with some chicken teriyaki and it was killer! This super fabulous recipe takes less than five minutes to make and is super low cal. Delicious and nutritious! Note: Dressing can be made a couple of days ahead of time and stored in the refrigerator. Then just toss the salad and the dressing right before serving. In a small bowl whisk together the garlic, sesame seeds, honey, soy sauce, rice vinegar, sesame oil, and olive oil until well combined. 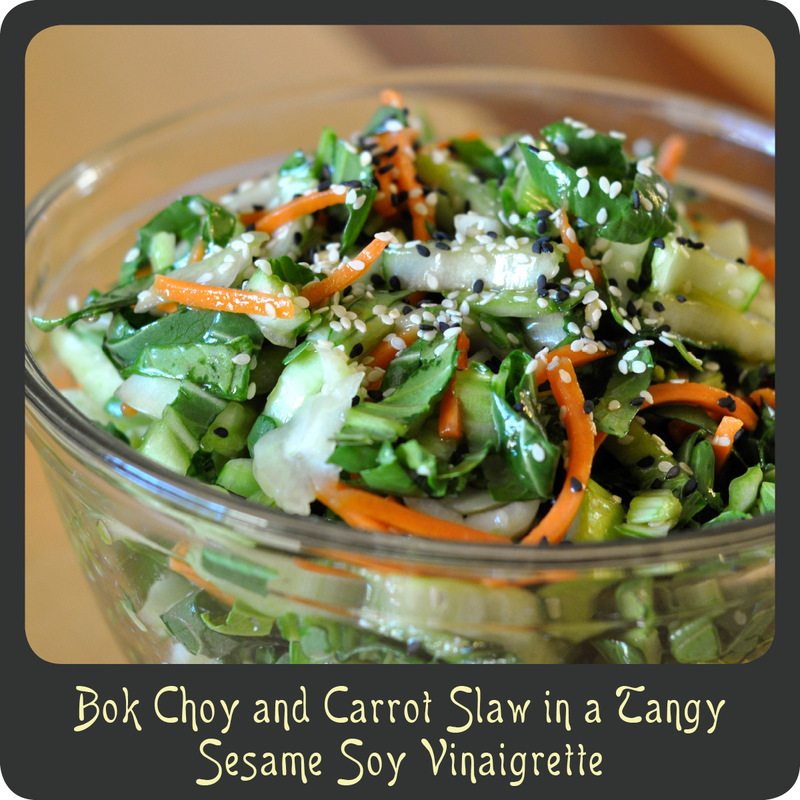 Pour the vinaigrette over the sliced bok choy and shredded carrots and toss to coat. Garnish with extra sesame seeds if desired. Recipe adapted from The Cozy Apron.